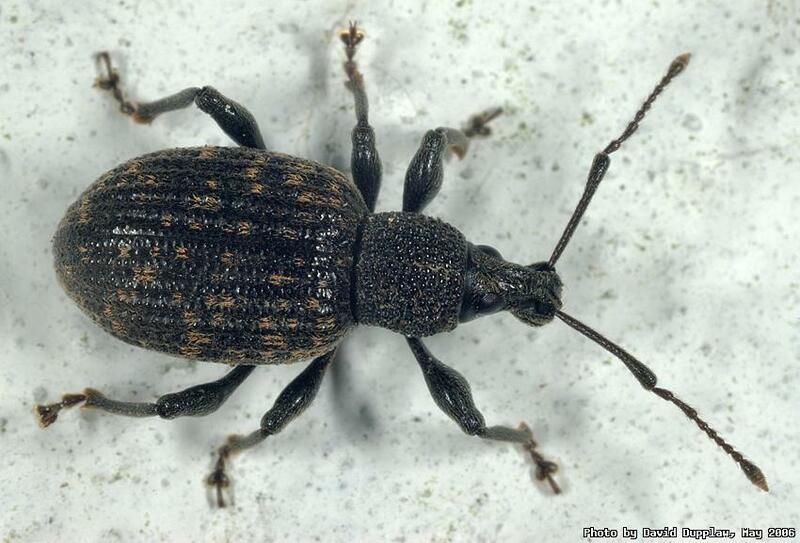 It's incredible that during the first 11 months of having a D70 and doing macro work, I've never managed to see a weevil; yet they're the largest family of animal (yes, any animal) in the world, with over 50,000 species. This is the Black Vine Weevil (Otiorhynchus sulcatus), a relatively large (perhaps 2 inches) beetle-like insect, and I found it wandering along our wall. Weevils are easily recognised by their snouts (they're also known as snout beetles) and they are covered in hairs, or scales. You can see the eyes of this weevil set back from where the antennae come out. The Black Vine Weevil is well known as being a pest, because its larvae eat the roots of plants like strawberries and, of course, vines.